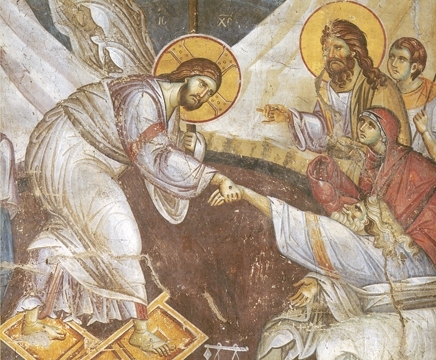 This icon is a detail of the Resurrection from the Protaton Church in Karyes, Mount Athos, from the early 14th century, and was painted by the most celebrated iconographer of the Macedon-ian School, Manuel Panselinos. This school of iconography is powerful in that although there is balance achieved overall, the asymmetry of form produces a lively dynamism which reflects the progressive dynamism of Heaven where those who live there grow throughout all Eternity. Here Christ stands on the broken doors of Hades now utterly destroyed in its power to hold men captive, and the keys of the door now smashed and crossed are seen below them. Christ leans forward to take Adam by the hand and bring him out of the abyss and Eve is seen just above her husband, for Christ has come to lead all those who are ready out of this place and back again with Him into Paradise. St. John the Baptist is seen above Eve, looking at the Risen Lord of Life Whom he had preached before him. We, too, can be with the Resurrected Christ if we love Him and His Kingdom above all things, and purify ourselves from sin.